No, you can book an available parking space in the car park of your choice. As soon as you pass through the barrier with your QR code you can park in any available parking space. To find a parking space quickly, simply follow the car park routing system in the car park. Will I receive a confirmation e-mail for my booking? Yes. Once you have completed your booking, a confirmation e-mail will be sent to the e-mail address you provided. As the confirmation contains additional helpful information, we recommend that you print it out and take it along on your trip. What do I need the QR code in the confirmation e-mail for? You can print out the confirmation e-mail and QR code at home and place it with your travel documents. Hold the QR code to the scanner at the entry barrier (see picture). Once your booking data have been checked, the barrier will open automatically. After your return please go directly to the exit. The barrier will open also automatically. If any additional payment is required you can scan the QR code at any ticket machine at the airport, or directly at the exit barrier. Is an available parking space guaranteed with my booking? Yes. A parking space will be reserved for you in the car park of your choice. Even if the display says „Besetzt„ (Full), you can enter the car park. To find a parking space quickly, simply follow the car park routing system in the car park. What should I do if the car park sign says "Besetzt" (full)? If you have completed your booking and have received a confirmation with an access code (QR code) for this period, we guarantee you a parking space. You can ignore the "Besetzt" (full) sign and enter with your QR code at the barrier. To find a parking space quickly, simply follow the car park routing system in the car park. Why do I not see all car parks when making a booking? Availability is checked in the system on the basis of your requested date and times, and the various parking options are then displayed. If a car park is not displayed there are either no more available spaces or all the offers have been taken. Please note that demand for special offers can be very high. The booking is only complete upon receipt of the confirmation e-mail. What happens if I arrive earlier than planned? You can arrive up to 3 hours earlier than the booked time without having to pay a supplement. In other words, if you book a parking space as of noon, you can arrive at 9 a.m. on the same day. What happens if I park for longer than planned? If you park for longer than planned and outside the tolerance limit, the remaining time will be charged at the ticket machine. You can pay with CHF, EUR, credit cards, a Maestro card or a Postcard at one of the many ticket machines. Where can I enter the promotion code? If you have received the code within a campaign, you can use the respective direct link. For all other cases, please use the field "Promotion Code" in the product overview and then click on "Apply" to check the availability. The availabilities and conditions are listed in the respective campaign emails. Only one promotion code can be entered per booking. How do I know that the promotion code is being used? If you visit our site via the link of a promotional e-mail, the code will be applied automatically and displayed with the action title. Alternatively, you can insert the promotion code manually and click on "Apply". Can I use the offer later or on-site? No, online promotions are only applicable to online products. Additional terms are listed in each campaign email. If you have problems with the booking, you can call the support hotline on +41 43 816 86 10 (Mo-Fr 09:00 - 17:00). If you have any problems entering or exiting the car park, please press the Hilfe (Help) button on the column. You will be connected directly to the Access & Parking Office. If it is possible to cancel or change a booking, this will be communicated together with the booking confirmation. To cancel or change a booking, you can click on "Manage my bookings" at http://parking.zurich-airport.com and follow the instructions. If you do not commence your trip or do not show up, you will be charged for the entire amount. If you change your booking, we do not guarantee a parking space in the same car park at the same terms. What happens when I change my booking? After entering the correct dates / times, press «Refresh». You see all available products - you have to select the desired product again. If the amount differs from the previously paid amount, the new amount will be fully charged and the amount originally paid will be refunded to you in the same step. If the amount remains the same, the step "continue to pay" must still be selected again - a new charge does not take place in this case. In both cases, you will receive a new booking confirmation with a new reference number. The entrance to the parking garage is only possible with the latest booking confirmation. Can I use the same credit card for several bookings? Yes. As you receive a separate booking number after each booking, you can use the same card several times. Why is my credit card needed for the booking? 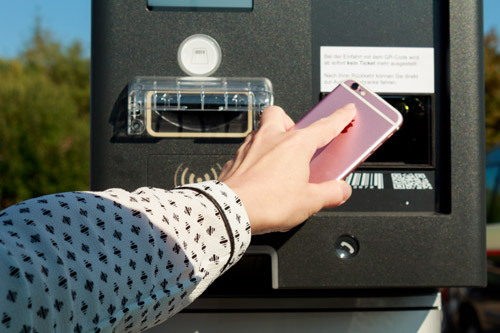 An electronic payment method is required to pay the parking charges. You can pay conveniently with various cards (MasterCard, VISA, AmEx and Postcard). What should I do if I have taken a ticket at the entrance but did not verify my identity with the QR code? If you have mistakenly taken a ticket, please leave the parking area as soon as possible and re-enter again using the QR code. It is important that you use the QR code to enter enter, as your booking will not be recognized otherwise. Can I enter and exit the parking space more than once? No, the authorisation applies for a single entrance and exit. Will I be reimbursed if I exit earlier than planned? No, reimbursements are not possible. How do I find my booked parking space? On the booking confirmation in the section "Getting to the car park" you will find two links which lead you directly to the parking lot. You will also find an overview of all the park locations there. Inside the parking garage you choose a free parking space. When does the shuttle bus leave for / to the P17? An overview of the shuttlebus timetable can be found here: Timetable Shuttle P17.